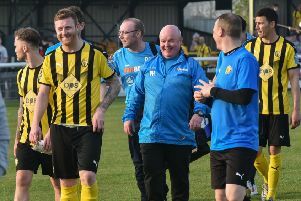 Leamington were forced to settle for a point after a terrific second-half performance had left their full-time opponents clinging to the ropes, writes Paul Okey. The visitors, backed by a huge travelling support, had led at the break courtesy of an Andre Brown strike. However, Ahmed Obeng equalised 12 minutes after the break and the home side visibly grew in confidence, wasting several gilt-edged chances to go in front, while also seeing Harriers keeper Brandon Hall pull off a couple of smart saves to keep a rampant Brakes at bay. James McQuilkin fired an early free-kick over the bar from a promising position for the visitors before Brakes, whose excellent discipline without the ball was a feature of the afternoon, slowly took control. Kaine Felix, restored to the line-up after recovering from injury, had a shot shovelled over the bar by Hall following good link-up play with Obeng, while Kieran Dunbar’s rasping first-time strike from a half-cleared free-kick was parried away at full stretch by the visitors’ number one. Callum Gittings was then a whisker away from giving Brakes the lead, glancing on Dunbar’s corner, only to see it slide just past the far post. The near-miss roused the visitors from their slumber and Junior English was in well at the edge of the box to block a shot from Liam Truslove, with the attack eventually petering out with a tame shot from Brown. Joe Ironside then took too long to get a shot away after Harriers had worked a promising position on the edge of the six-yard box. James Pearson wasted the visitors’ first clearcut chance, producing a defender’s finish to sidefoot over Elton Ngwatala’s cross from the left after a scything counter from the visitors. Tony Breeden got himself in some discomfort after McQuilkin’s ballooned cross came down close to the crossbar, the home keeper only succeeding in pushing the ball back into play. However, Brakes eventually scrambled clear. The visitors’ pressure was building and it was no surprise when they hit the front despite an element of luck being involved in the strike. Brown was afforded too much space on the edge of the home box and when he was belatedly closed down his shot deflected off the heel of Connor Gudger and over the stranded Breeden to give Kidderminster the lead. Brakes could feel aggrieved to be behind but it could have been even worse nine minutes before the break when English and Richard Taundry challenged for the same high ball, leaving Ngwatala with time and space just inside the box. However, the Frenchman hurried his shot and got his connection all wrong. Kidderminster had the first effort of the second half, James O’Connor’s strike from distance proving comfortable for Breeden, before Brakes took a grip on proceedings. But whereas their first-half ascendancy lasted only until the quarter-hour mark, they rarely looked like relinquishing their second-half control as a vibrancy and belief spread through the side. A 25-yard Jack Edwards strike was deflected through to Hall before Leamington got back on terms in the 57th minute. Kidderminster’s determination to play the ball out from the back had already caused their fans one or two heartstopping moments and as Brakes hunted and harried, Fraser Horsfall was closed down by Dunbar to hand possession back to the home side. Callum Gittings then picked out the run of Obeng whose chest control took him past a defender before he wrongfooted another with a neat feint. Hall then committed and although Obeng’s finish did not match the quality of his approach play, the keeper was unable to stop the shot dribbling over the line despite getting a strong hand on it. Dunbar was again in to steal back possession for Brakes but with the home side boasting a three on two, Jack Edwards selfishly chose to shoot with the better-placed Dunbar crying out for a return ball. Brakes were then denied by a superb goal-line clearance from Lee Vaughan, the substitute appearing from nowhere to intercept the ball after Felix looked certain to turn Dunbar’s pull-back over the line from close-range. Harriers retaliated with a couple of long-range efforts from Ryan Croasdale and Ngwatala before the home side wasted another overlap. This time it was three on one, with Kurtis Revan, Obeng and Dunbar breaking forward at pace with just a retreating Vaughan for company. And again it was the substitute who came to his side’s rescue, deflecting Obeng’s shot past the post with his head. A determined run and shot from Joe Clarke drew a smart save at his near post from Hall, while a Horsfall effort slid past the woodwork with Breeden scrambling. Daniel Bradley was unable to sort his feet out after Ngwatala put in a threatening cross but fittingly it was the home side who had the last word, Revan drawing another fine stop from Hall from a well-struck drive in injury time. Brakes: Tony Breeden, Richard Taundry, Connor Gudger, Joe Clarke, Jamie Hood, Junior English, Kieran Dunbar, Callum Gittings, Kaine Felix (Kurtis Revan, 80), Jack Edwards (Liam Canavan, 70), Ahmed Obeng (Joe Magunda, 90).Subs not used: James Mace, Stefan Moore. Kidderminster Harriers: Brandon Hall, James Pearson, Joel Taylor (Lee Vaughan, 62), Ryan Croasdale, Fraser Horsfall, James O’Connor, Andre Brown, James McQuilkin, Joe Ironside, Elton Ngwatala, Liam Truslove (Daniel Bradley, 62). Subs not used: Andre Wright, Tyrone Williams, Sam Austin.